As a high priced digital solution for your water softener needs, this Fleck 5600SXT is an interesting solution for those that want some of the best water softening equipment the industry has to offer. There are a lot of features this unit comes equipped with, and all of them are easy to understand. For those that need better explanation, there is a thorough instruction manual included that does a great job of going over the finer details of the unit. 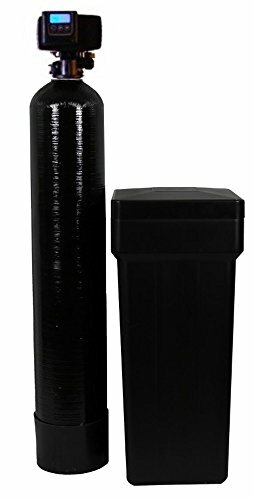 It works in big and small homes, and is a reliable alternative to those that want something more recent for their water softener needs. As a complete system that comes with 2 tanks with their own individual responsibilities, it’s a large but welcome option if you want the best in that size. This won’t fit in small spaces, but it will do a big job. Headquartered in Worsley, Greater Manchester UK is Pentair Ltd., the owner of Fleck. Pentair is a multibillion dollar company that employs over 30,000 people worldwide, and is one of the larger companies with a stack in the water softener business. They own several brands, so their piece in the water softener industry is a small one of many. They are a very successful company that has made a habit out of gobbling up smaller successful business in the water related field, and has done so to great triumph. By doing this their business has growing rapidly, but in a way that does not decline quality. Because of the great eye for acquisitions and technology the company’s products are usually at the forefront of any breakthrough in the business. That means whatever product you buy from them is more than likely going to be fitted with more up to date components than any other company in the industry. The company history is rich, and the customer support is terrific. Consumers that buy from this company will get iron clad warranties and quick customer support without any headaches. Pentair is a big company that up to this point has done everything right to make it one of the biggest and most successful business in the market. Surprisingly, the colors are very vibrant and stand out. Buyers have the option of almond of the default of black, with the almond being a personal favorite among some users. Both tanks have a long 10 year warranty that will surely be more than enough for your needs. The warranty includes quick and on point customer support without the hassle of a long wait. The unit can handle moderate to hard water, and has a GPM flow rate of 12 for those that are interested. The two dimensions of the tanks are 10×54 with the brine tank being 14x17x33 with a safety float valve. As an on demand system consumers will waste less resources are the unit not only learns when to regenerate but also being able to be programmed at your will. The unit will generate at the best times possible, so you aren’t left with a restricted flow of water. The 5600 valve comes with a 5 year warranty, and for an electronic component that is an outstanding amount of time, and can’t be beat. The panel has a backlit LCD display, 48 hour internal power backup and touch pad controls. The entire system is very user friendly and easy to learn within a day, with little supervision. With minimal plumbing skills, the system can be installed in under 2 hours, and it can hold up to 250 pounds of pelleted salt. This is not the easiest to install, and those without some general knowledge of plumbing may easily go past the 2 hour limit to install. In cases where things seem too complicated even with the directions, a professional is advised, which of course pushes up the price of the product. This is a rather large two tank unit, and placement will be an issue in some homes that don’t have the space. This is less of a problem if using a professional to do the install, but less informed users may find themselves in a pretty bad situation after a couple of hours of trying to figure out where to place it. Buyers are looking at 150+ pounds of water softener equipment, as this is a big boy that should be handled by a single professional or more than 1 novice user. Less technical users may be a bit overwhelmed with the documents that come with the packaging. Staying with the same company, their higher priced Fleck 7000SXT Water softener 96,000 grain capacity with 7000 SXT metered valve seems to be a good water softener to make a comparison too. It is the upgraded version of the 5600SXT and offers a higher grain capacity, better handling of hard water and high water usage and also a cleaner design. This is for buyers that have bigger than average homes and are looking for the one all solution. The 5600SXT is fine for most users, and works just as good as this model and for half the price. Although it may be tempting to purchase the upgraded model of the 5600SXT, consumers should know that unless they have a larger than average home then the extra features they get with the upgraded model are not worth the asking price. The 5600SXT has so many great features and is so efficient that in many cases it is the best one size fits all option from Fleck for small and large homes. In a situation where the consumer knows they will be moving into a larger home, then it would be smart to look into purchasing the upgraded option, but other than that situation this is a fine purchase. Also because of the size, buyers should look at their current situation and decide if it is too big for what they need. This is one of the bigger and heavier water softeners on the market so be well prepared to install. The price has stayed the same since its release, which is always a sign of a great product that is already at the optimum price level. Even with further releases from the same company the price will stay largely the same, as consumers are already getting a blockbuster deal for their money. The peace they get by using soft water is one of the basic benefits. Check out the accessories for a bit of a discount, as the main unit will continue to be high priced for a very long time, even through the holidays. Modern water softeners come in bunches, but that doesn’t mean that all of them are worth your money. The brand name of Fleck is enough to make people take a look in the direction of the 5600SXT, but it is the supreme efficiency of the model and the line that keeps customers coming back for more. The upper iterations of this model are just as good, and the company has shown over the years that they know how to make water products. This is one of the best creations yet, and one that consumers can count on for the lifetime of the device.